There are many factors to consider when deciding whether a crop is good enough to carry through to harvest, for example, feed value for livestock, potential weed seed set, level of herbicide resistance, the amount of grain that can be picked up by the header, cost of harvesting and likely grain and livestock prices. It is possible that many paddocks will not be harvested this year in the eastern and northern Wheatbelt. Although this is not the option farmers were hoping for, it does provide an opportunity to clean up weedy paddocks and set them up for next year. The first objective is to achieve good cover of the paddock to protect from wind erosion. To achieve this, the paddock should not be sprayed/grazed until just before the first weeds are getting ready to set seed. Paddocks that have yielded less than half a tonne per hectare are likely to be at risk of wind erosion because there will be less stubble available to anchor the topsoil. For every 1mm of soil lost through wind erosion, future yields can be reduced by up to 2% so it pays to monitor grazed paddocks during summer to maintain adequate groundcover. While many growers with disappointing crops last season will be thinking about getting some value from these failed crops by using them for feed, it is important to consider the consequences of this choice. Wind erosion and loss of valuable topsoil is a real possibility to carefully assess before grazing paddocks. the soil is loose or disturbed from grazing. If a paddock has more than 50% groundcover, ensure at least one-third of the crop or stubble remains standing or anchored to the topsoil to help stabilise paddocks during strong winds. Loose plant material provides little protection from erosion. Lupin paddocks will be particularly susceptible to erosion after harvest, so monitor these closely if considering grazing sheep on lupin stubble. If stubble cover is low, it is worth selecting a suitable site on farm, in a well-protected area for a temporary feedlot, to relieve pressure on paddocks. For further guidance on the necessary level of groundcover required, refer to Diagnosing wind erosion risk. If possible, it may be a good idea to graze with your own/agisted stock to reduce the bulk of weed growth and delay seed set. Slashing is another option but this machinery is limited/temperamental and is costly. There should be no shortage of hungry sheep about this year to help. Grazing should be carefully managed to ensure that soil cover is not compromised. The main option for most paddocks will be to use two sprays of knockdown herbicides in spring. The most common treatment used is likely to be glyphosate at 1.5-2L/ha + 2,4–D Ester 680 at 300-500mL/ha. Ideally the double knockdown strategy should be applied where a glyphosate brew is applied first (at head emergence/flowering of the first grass) followed by paraquat (about 3-4 weeks later). This will minimise the risk of glyphosate resistant weeds (for example, ryegrass) being selected for. Many growers will be keen to use two applications of glyphosate to keep costs down and maximise weed kill. If you must do this, consider a light graze after spraying, when the paddock has browned off, as a cheap double knock option (that is, the stock will eat any surviving glyphosate resistant weeds). Other chemical fallow options may include the use of a diuron/atrazine type mix in winter to reduce weed growth prior to spraying out in spring. This is a risky option this year as these paddocks may never achieve enough cover and will be left prone to wind erosion. This year, many so called 'weeds' will be doing you a favour by holding the soil together and providing cover. Don’t kill them too early. The main weeds to focus on are doublegee, Paterson’s curse and wild radish. Fortunately the first two can be controlled with metsulfuron. The addition of a Group I phenoxy herbicide in the mix may kill some radish or at worst delay flowering to set up for seed set control. Soils that have a capacity to store water can be sprayed out to maximise the amount of water that is carried forward. The earlier this is done, the greater the amount of water and nitrogen that is stored. In a year such as 2017, keeping costs down and minimising losses is an important aim. However, this can result in weeds setting seed in crop, which can quickly undo many years of hard work to erode weed seed banks. Chaff lining is a technique where the header is very simply modified so that the weed seeds end up in a compact windrow on the ground. Perhaps this may be the year for growers to consider adopting this technique, to cost effectively deal with weeds setting seed in these low yielding crops. The stubble is spread as normal from the spinners on the header. The chaff containing the weed seeds are deposited as a thin strip on the ground by fitting a home-made chute and moving the stubble chopper a short distance. Growers have found that the weed populations emerging from these compact windrows created are relatively small. For more information refer to WeedSmart's How chaff lining works. Do you need to feed sheep right now? A late emerged crop has low biomass, but if they have a serious weed burden then it is tempting to use grazing to deal with the weed seed set problem. Weeds that have survived a herbicide treatment usually have a level of resistance and can effectively be given a ‘double knock’ by getting them down a sheep’s throat. However, these crops, even with out of control weeds, still have a very low level of food on offer and there is effectively no capacity to maintain adequate body condition in the sheep. If there is erodium or brome and barley grass, you need to make sure that seed issues don’t interfere with grazing. There are potential carcass downgrades with seed damage as well. The large paddocks that we have in the northern and eastern Wheatbelt work against effective grazing especially where there are not enough watering points in the paddock. There is also a high risk of wind and water erosion in areas with low groundcover or on camp sites. For information on grazing strategies refer to Strategies and tactics for sheep producers in a poor season. The decision to sacrifice a crop is not one that can be made easily. Paddocks are very variable so an estimate of the amount of grain that could end up in the bin could be very rubbery, especially for canola. For the equation for calculating yield in the paddock, refer to Estimating crop yield. Once you have an estimate of yield, then the breakeven yield can be calculated. For guidelines for calculating break even yields, refer to Breakeven yields for wheat and canola. 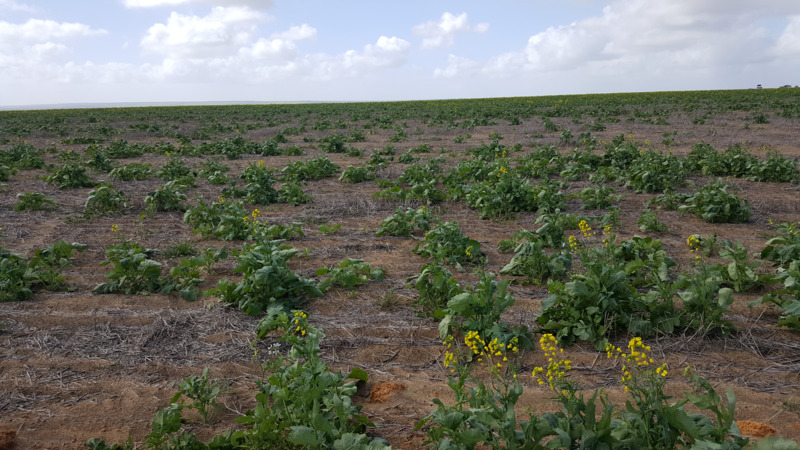 Seasonal conditions for a large portion of the Wheatbelt have been challenging with very late establishment, low crop biomass and the looming threat of a blow out in weed seed numbers. There are a number of ways to manage these weed burdens without early removal of the crop so growers should think about the options outlined here and consult their agronomist. For more information refer to the Weedsmart website.